I’m boxing my books in preparation for upgrading the basement, currently home to a very large desk, two file cabinets, and fifteen book cases, not counting the three DIY cheapies. My library has grown, or rather gotten out of control, since we moved in over a decade ago. For a while, I was a book aggregator. I didn’t collect books so much as amass them in vain efforts to be a “completist.” To be fair, I’m the guilty party. Karen reads virtually every book she buys, while I too often buy them for the day I hope to read them. In the case of hundreds, it ain’t never gonna happen. I’ve tried to be a little more sensible in recent years, with mixed success. We’re still buying books, but Karen has jumped with both eyes into the world of e-books. That makes shelving and now boxing easier. We’ve both been culling our physical collections. Countless readers have characterized their books as treasured friends or close family members. Parting with any of them puts a pit in your stomach, if not a hole in your heart. But we’ve donated or sold some 500 volumes over the past four years. Here again the Mrs. is leading the way while I try to keep pace. Packing the books is slow going. That’s partly a function of trying to select and arrange, one box at a time, volumes that will form perfect cubes inside a box’s space. The seemingly endless dimensions of books complicate the task. The real work slow-downs are the product of memories and emotions triggered by lifting books off the shelves, gazing at their covers, and flipping the pages to remembered or random passages. 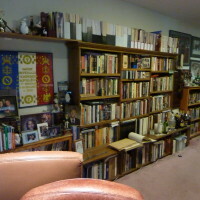 Two weeks ago, I counted 1,674 books on fifteen bookcases (one of them a monstrous eleven feet long) shelved in the basement office, with another 150 taking space on the two Kathy Ireland seven-footers on the main floor. These don’t include Karen’s collections (the family total is about 2500 volumes). They do reveal that my own tastes have been, within a narrow range, rather broad. There’s very little literary or genre fiction, only a smattering of science and technology, philosophy and religion, social sciences and language, and even less poetry and drama (aside from Shakespeare). I’ve spent a half century throwing my money at history and biography. Since early childhood, without a single significant gap in time, that is what I’ve read. And since my teens, that is what I’ve wanted to write. I’ve filled and stacked some twenty boxes so far, mostly loaded with books on the American Civil War, World War II, historical true crime, and the popular performing arts of film, television, and music. A thousand-plus books await their turn in the journey from wood to cardboard. Books on American history from colonial times through the nation’s westward expansion, to the “groovy” and tumultuous Sixties and beyond. Books on European history from Homer and Thucydides to Thiers and Churchill. Others by favorite nineteenth century writers and books about books, language, writing, and publishing sneer at my so-far meager efforts to corral them. Each time I lift a stitched paper friend off an oak, pecan, or pressed wood shelf, I take a moment, and sometimes come to a dead halt, as I recall the book’s place in my life as a reader and writer. Quite a few volumes represent steps forward (or sideways) for me, and occasionally turning points. These might be labeled “the books that….” The books that made me love history. Biography. Epic tales and intimate stories. The books that inspired me to write. To leave my comfort zone and jump headlong into people and places I knew nothing about. To write Salt Warriors and try my hand at a forgotten child kidnapping. They are the books that grabbed and shook me. I’ll tip my hat to them in coming posts.